A WPEngine Review - LeapFroggr Inc. Given the sheer number of websites with WordPress as their content management system (CMS), it’s little surprise that webhosts exist serving only such websites. A webhost focusing on only one CMS can afford to deliver improved support and user admin experiences. After all, the engine behind all of its hosted websites is basically the same, which means fewer compatibility issues and scenario variations to work out. WPEngine is an example of hosts like the one we just described. It offers managed WordPress hosting that can be scaled up or down based on your requirements. In that sentence alone, two words tell you a lot about how hosts like WPEngine work: “managed” and “scaled”. “Managed” means it does a lot of the hosting-related/technical work for you, from site transfers to minor CMS patching. This can free up quite a bit of time or just spare you tasks you’d rather not deal with yourself. “Scaled” means it offers several hosting plans—including a customizable Premium level—at different price and capacity points for its customers. So now, the question: are WPEngine’s management capabilities and plans right for you? Read on to find out. WPEngine is quite straightforward about its plans. Generally, you can get near-full functionality at each level, with plans being distinguished from each other more by limits than by features. It also allows customers to demand a refund within the first 60 days if dissatisfied with their services (customers on the enterprise plan are excluded from this). As for its plans, they start at $29 a month. This is for the Personal plan, which is for those who want to test its abilities first or people who have only one website. It has a single-install limit, up to 25,000 visits a month, and 10GB of local storage. Next is the Professional plan, which costs $99 a month. This is for people with one steady-traffic site or several smaller sites. It allows up to 10 installs, 100,000 visits a month, and 20GB of local storage. Next up is the Business plan at $249 a month and 25 installs. It delivers up to 400,000 visits a month and 40GB of local storage. All three of the plans we’ve just mentioned are shared hosting plans. At the higher end of the performance and price spectrum, WPEngine offers dedicated hosting in its Premium and Enterprise plans. The former allows 150 installs, visits of more than 1 million a month, and 100-300GB local storage. The latter is a multi-server solution for up to 150 installs, more than 5 million visits a month, and 400GB to 1TB of local storage. 1. Staging area – This is one of WPEngine’s best features. It allows you to test new designs, plugins, themes, and more without having to alter your website in the process. 2. Automatic caching and CDN capability – The content delivery network is actually built in at the Professional plan and higher. 3. Fewer reports of site deletion – This isn’t a hard and fast “pro” on its side per se, especially as it’s hard to measure the actual numbers, but there seem to be fewer cases of people getting sites deleted by WPEngine for service non-payment compared to what happens on many other big hosts. 4. Automatic and manual backups – The ability to create and rely on multiple restore points gives you peace of mind as well as easier site testing. 5. Support Garage – This is the support area for WPEngine and it has a pretty good knowledge base. 6. 24-hour support – It’s only email and ticketing, of course, but it’s not bad compared to some hosts that have off-times even for that. 1. Telephone support has limited hours – If you want to call support over your phone, you can only do so Monday to Friday from 9 in the morning to 6 in the afternoon. 2. No option for dedicated IP address on the Personal plan – Not really a deal-breaker, especially for most Personal plan users, but one does wish it had been an option. 3. No email management – There are workarounds, but again you wish it had been offered. 4. Cost – The plans aren’t cheap if you consider their install, storage and traffic allowances against their monthly prices. It’s the usual thing with managed hosts, though. 5. Reported decline in customer support in 2014 – This was shortly after WPEngine received a huge amount of money from a VC and underwent a rapid expansion that the host’s founder claimed to have resulted in their difficulties with support that year. We actually think WPEngine isn’t a bad WordPress host—in fact, sites we put on it had pretty good performances for the most part. We didn’t have many difficulties with support either, although some of our questions would take a while for follow-up (immediate answers were swift, but not necessarily solutions). We hear it used to be far swifter and more knowledgeable, but for our money’s worth, it was decent. Where it shines is as a webhost for people using the lowest tier of its services. It’s still not cheap then, technically speaking, but manages to offer great value for less experienced site owners nevertheless. The effort it spares them is worth paying for as such people aren’t experienced enough to handle what WPEngine does more quickly than it can. This also frees up more of their time to focus on growing their sites or putting out more content. It may not be the right option at the higher plans, though. We didn’t see enough “scaling up” in terms of capacity and performance to merit the costs of the upper tiers among its solutions. 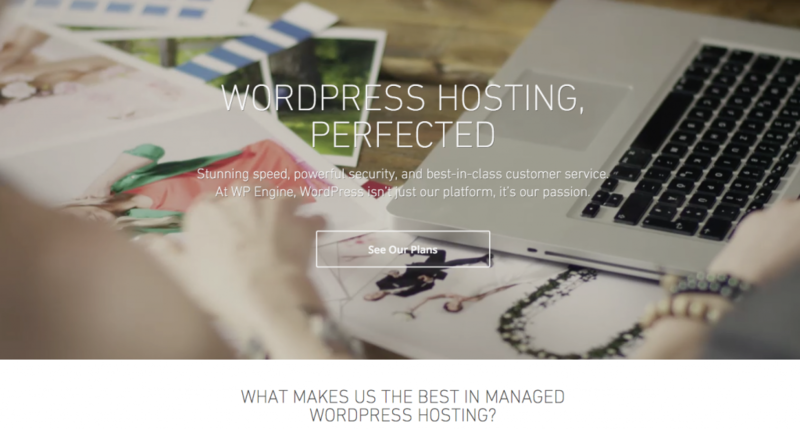 There are cheaper hosts to be had here—and even if they aren’t all managed WordPress ones, they can still serve you just as capably if not better at these levels. You can test it for yourself on the 60-day risk-free agreement (unless you want to try the Enterprise plan), of course.